The UCCRI-ML is contesting elections to the Loksabha, with the above call, by fielding candidates in Telangana (10 constituencies out of 17) and Andhra Pradesh (3 constituencies out of 25).The UCCRI is an organization, founded by veteran communist revolutionaries DV Rao (1917-1984) and Tarimela Nagi Reddi (1917-1976), which believes that the present system can not be changed by parliamentary path. Thus it is basically different from the parliamentary Left. However, it regards participation in elections as a question of necessary tactics, to be decided chiefly on the basis of the level of consciousness and preparedness of people, among other things. While basically organizing a revolutionary mass movement in various sectors and classes of people, it regards participation of elections as a secondary form of struggle.Therefore, unlike some groups which give a call for boycot of elections, which is heeded by few voters and that too in very very limited pockets, UCCRI particpates with a view to educate voters, to expose ruling class parties, to remove illusions among people, to spread its program and politics,and to retain and expand its areas of work. Election time is utilized to educate people in revolutionary politics: Hundreds of its cadres go into people and distribute lakhs of pamphlets as part of its very frugal campaign, which also includes playing recorded messages and revolutionary songs besides holding street-corner meetings wherever possible. It is not a part of any alliance, direct or indirect. 13 parliamentary constituencies in the two Telugu states equals 71 Assembly segments. It had contested, it may be recalled, in about 12 Assembly segments in 1983, the first time it implented this tactical policy. The CPI and CPM decided recently to contest two parliamentary constituencies each in Telangana, and both have alliances, it may be noted. These two parties had nil representation in the outgoing 2014-19 Assembly in AP, and nil in the latest Telangana Assembly election held in 2018 December. Thay had one MLA each in Telangana during 2014-18, and lost both despite class collaborationist alliances, with lowest vote ever. . Following is the English version of a pamphlet in Telugu issued by UCCRI-ML in Telangana which explains thier policy and tactics. Defeat the reactionary BJP in the Lok Sabha elections! Support the candidates of UCCRI(ML)! . The Unity Centre of Communist Revolutionaries of India — Marxist-Leninist (UCCRI-ML) is contesting the Lok Sabha elections with the slogan – Defeat the reactionary Bharatiya Janata Party (BJP) and its allies. The UCCRI(ML) candidates are contesting in the following ten constituencies (out of 17) of Telangana State (TS): Adilabad, Bhuvangiri, Karimnagar, Khammam, Mahabubabad, Malkajgiri (part of Hyderabad city), Nagarkurnool, Nalgonda, Peddapalli, Warangal. UCCRI(ML) appeals to the people to support the communist revolutionaries of UCCRI(ML) who are providing the leadership to the revolutionary mass movement. The BJP-led NDA government had an unhindered stint at the Centre for the last five years. During this period, problems such as poverty, unemployment, price-rise faced by the people were not resolved even to a little extent; not to speak of the basic problems of land, democratic rights and independent foreign policies which are far from any resolution. The discontent that has resulted from such a situation is sought to be diverted by the BJP by raking up issues like terrorism and national security, and by inciting, on a massive scale, national chauvinism-jingoism. In fact, this government during its five-year rule has been serving American imperialism, together with some other imperialists, with its subservient policies, while indulging in hegemonism in relation to the neighbouring countries. While adopting policies of communal frenzy in a brazen manner, it has been serving the interests of landlord classes and the big business. Not only it has ditched the people by throwing their interests to the winds, but it has adopted repressive policies towards them. Even while mouthing cooperative federalism, it has curbed the role of the State governments, and curtailed their powers subordinating them to the all-powerful and autocratic Central government. These policies and practices have little to do with what they had promised before the last (2014) Lok Sabha elections. Therefore, irrespective of their deceptive promises now, the reactionary BJP and its NDA allies need to be defeated. Coming to the politics of TS, the Telangana Rashtra Samithi (TRS), which has come back to power in recent Assembly polls (preponed to 2018 December), is going about with the propaganda that it would steer the all India politics by winning all the (16+1) Lok Sabha seats. In reality, it had failed to deliver goods in the 54 months of its rule: The unemployed youth who had hoped their unemployment would be resolved in the new state were sorely disappointed. Promises made by TRS about important issues like lands and housing to the poor were not implemented (3 acres of farmland for all SC-ST families and 2-bed-room pucca house to all BPL families were promised during 2014 polls). It is indulging in a propaganda hype about a few petty concessions it gave to the people who are in fact facing acute problems. If the rural poor – the poor and middle peasantry – are provided with land and necessary farm inputs; if the youth are provided employment; if the workers and employees are paid adequate wages, they can live on their own with self-respect. But while depriving the people of their livelihood, robbing them of their employment opportunities, exposing them to ever high-cost of living, the rulers promise this and that – which is all an eye wash and a fraud, people should realize. The TRS has been criticizing the Congress and BJP saying they are chiefly responsible for several failures: it has accused them of robbing the rights of the States, of failing to solve many problems the country is facing and of leading the development of the country at a snail’s pace over the last seven decades and more. The TRS says it desires a new polity where the powers of the State governments are enhanced, the States are given autonomy, and the dominance of these two big wigs, Congress and BJP, is replaced with the rule by a Front of the Regional Parties. It is justified to ask for an end to Centre’s hegemony, for more powers to States, and seeking autonomy. However, even if States have autonomy, problems of the people would not be resolved as long as the rule by reactionary ruling classes continues. And that was the kind of rule by TRS the people of Telangana have experienced over the last five years. Despite all their criticism about Congress and BJP, the TRS has been conspicuously silent about the pro-landlord and pro-imperialist policies they had followed all the time. In fact, the TRS itself has been following the same polices. All the ‘development’ the TRS claims having achieved during its five-years’ rule, has been a golden era for the State’s landlords, for the big capitalists, the contractors and the foreign capital. The petty concessions it has extended to the people have not resolved the crisis in the lives of people, which in fact is continuing. Under these circumstances, people should realize that the TRS does not deserve their support in the Lok Sabha elections. The Congress party that had ruled the country for decades –and reduced the country into a happy hunting ground for the imperialist powers, for the landlords, and the big bourgeoisie — should not be allowed to come back to power. The CPI and CPM, with their class collaborationist policies, have reduced themselves into tails of one or the other of the ruling class parties, and have no alternative path for themselves. In the event, they have little that they can do for the people. 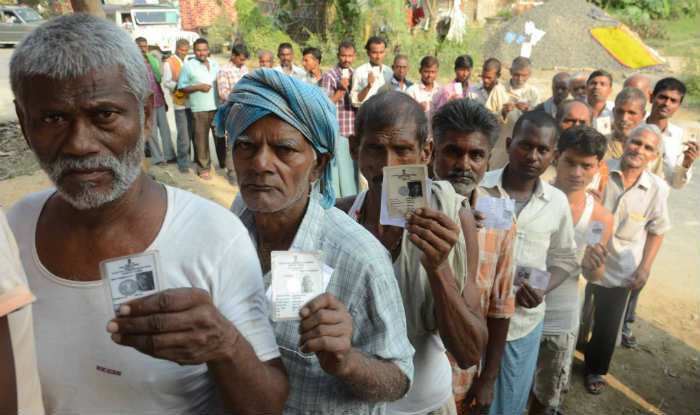 India claims to be the ‘biggest democracy’ but is also home to the biggest farce of the electoral democracy. Candidates spend crores of rupees to buy votes. There is a flood of money and liquor during election time. Those parties that are in power indulge in a massive and costly propaganda about their promises and in schemes which are blatant means of buying votes at public expense, this being an additional facility for the ruling parties. Various parties are giving and promising petty concessions to the people so as to encash them into votes. That being so, it is futile for people to nurse any illusions about them. The ruling class parties are using elections to deceive and lure the people so that they come to power, only to ditch the people’s interests after the polls, and to sub-serve the interests of the landlords, the big business and imperialists which is their real objective. People’s interests cannot be served with such forces at the helm. If the problems of the people are really to be solved, it is imperative that the landlord system must be abolished with a programme of land to the tiller; all the people on the path of struggle must have democratic rights for the same. American super power hegemony and imperialist exploitation must be put to end, and foreign and defence policies free from their control are necessary. Abolish the pro-imperialist foreign policies, particularly the pro-US super power foreign policy. Scrap all agreements which subordinate India’s defence and foreign policies to serve US hegemony. Follow independent defence and foreign policies. Stop the inflow of foreign imperialist capital and cancel foreign debts owed to imperialist institutions. Self-reliance and protection to national industries, in particular protection to Telugu national industry in our State. Abolish landlordism and distribute land to the tiller. An end to swamping of the country and State by pro-imperialist, pro-feudal culture, and development of anti-feudal, anti-imperialist education and culture; in particular achieving national unification of Telugu people and the all-round development of Telugu culture and language. Dismantle the machinery of repression in the country. Guarantee complete democracy for all national, democratic and revolutionary forces so that the present semi-feudal and semi-colonial political and economic system may be changed. The above policies are essential to the country. Only when they are fought for, people’s basic problems would be resolved. Only through such a struggle, people can liberate themselves from dire poverty, unemployment, price-rise, intense exploitation and oppression. We appeal to the people to extend their support to the candidates of UCCRI(ML) that is leading such a revolutionary mass movement, and thus support the revolutionary movement.